A Mohawk Hero In The Not-So-Diverse Gaming World The latest installment of Assassin's Creed, one of the world's most popular video games, has a hero who is part Mohawk. The game's creator says reflecting real 18th century Mohawk life was critical and hired a consultant to make sure the game was culturally consistent with Mohawk culture. For the latest installment of Ubisoft's Assassin's Creed series, set in Colonial America, the hooded main character is part Mohawk. The company brought in a Mohawk consultant and hired a Native actor to play the role. The Assassin's Creed video game series has become a megahit for gaming enthusiasts. The story line follows a bloody war between Assassins and the Knights Templar, first during the Crusades and then in Renaissance Italy. 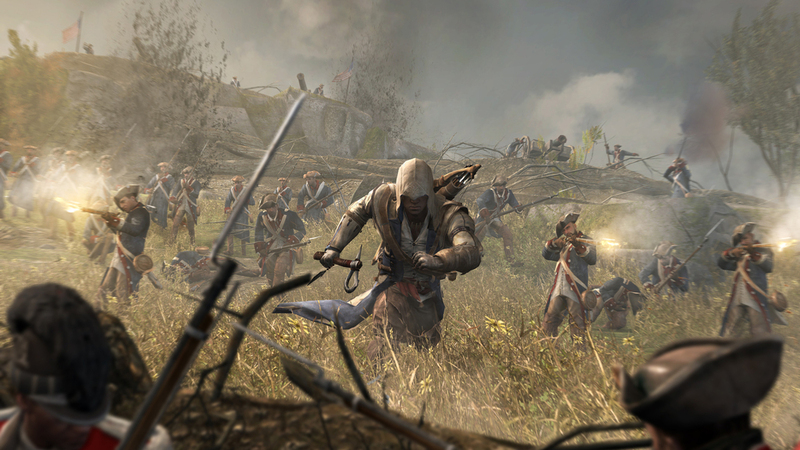 The newly released Assassins Creed III crosses the ocean and a couple of centuries so the action could take place during the Revolutionary War and would be wildly anticipated on its own. But the third installment is getting a lot of special interest for another reason: The game's principal character is Native American, and he's played by a Native actor — a rarity in the not wildly diverse gaming world. Alex Hutchinson, the creative director of Assassin's Creed III, has been an avid gamer for years — both for fun and for work. But as he began thinking about the story line for ACIII, he had an epiphany. 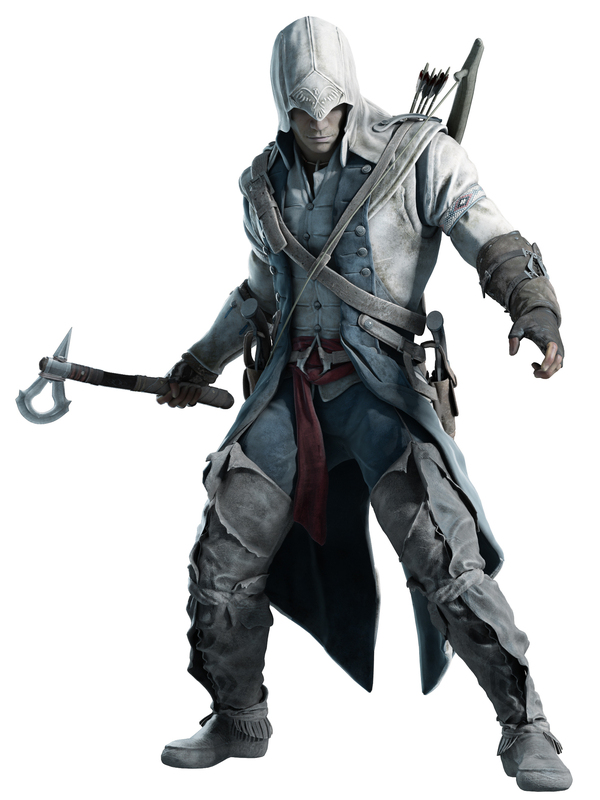 An artist's rendering of Connor, the Mohawk protagonist in Assassin's Creed III. "You realize after a while that you play a lot of young white protagonists. Male protagonists, usually," he said. "I thought it would really be exciting and sort of progressive for a big game company like ours to [create] a minority, someone who's an outsider — in our case, a Native American — who's pretty underrepresented in most media, let alone video games." A healthy chunk of the gaming market is boys and young men, although a 2009 study by the Centers for Disease Control and Prevention puts the average gamer's age in the U.S. at about 35. Many of the most popular games, including Assassin's Creed, are labeled for mature audiences because of violence, sexual content and language. By 2011, almost 30 million units of Assassin's Creed series had been sold. And because the games are set several hundred years ago, there's a lot of close-up sword and knife work, with the attendant carnage. "AC III" is no exception. Players have the option of killing their enemies individually or they can hunt in groups. In the "AC III" world, when they're not battling it out on the seas, the British and the Americans in the game are engaging in gruesome hand-to-hand combat in the streets of Boston and New York City. By placing the action in Colonial America during the Revolutionary War, Hutchinson and his colleagues at Ubisoft, the Canadian company that produces "Assassin's Creed," were give the chance to develop a Native American as the game's central character. They christened him Connor Kenway. Then, Hutchinson says, they ran into one problem they hadn't anticipated. "You realized that every Native American actor in America has been in Twilight," Hutchinson said. "So you had to really search for someone who was a unique, strong voice who people wouldn't be familiar with." 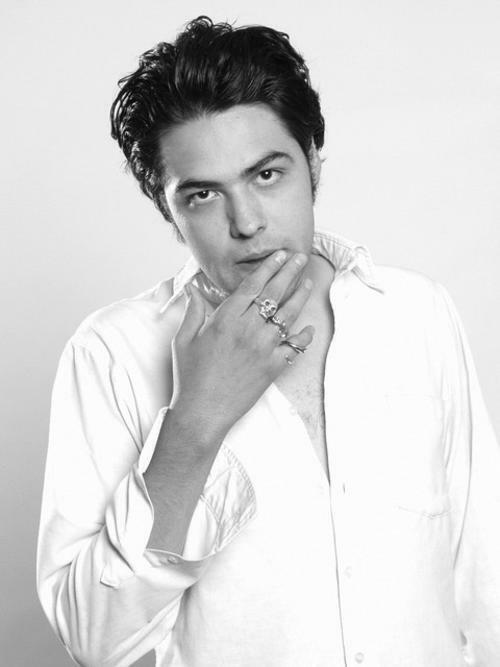 Enter Noah Watts, a Native American actor who wasn't part of the Twilight cast. In the studio, soft-spoken Watts became one with Connor. Actor Noah Watts, who plays Connor, is descended from the Crow and Blackfeet nations, and it took some work for him to speak the Mohawk language convincingly. "It was very difficult, the language is very beautiful," he says. "His native name, his Mohawk name, is Ratohnhake:ton, which means Life Scratcher," Watts says of the character he plays. Connor is half-Mohawk and half-English. "I have known a world of peace and remarkable spirit, a world which was taken from me," Watts says in the soft tenor he gives the Connor character in the game. After his people were slaughtered and his village burned, Connor began a yearslong quest for justice. Watts is descended from the Crow and Blackfeet nations, both with languages very different from Mohawk. So to assume Connor's character, he had to learn to pronounce Mohawk convincingly, if not fluently. "It was very difficult, the language is very beautiful," Watts says. "But honestly, that was one of the most difficult days." A Mohawk consultant, Thomas Deer, was hired to coach Watts on the Mohawk language. He also made sure the onscreen details of Connor's Mohawk life were correct, from how the village looked to what customs villagers observed. Making sure to correctly portray Mohawk life during the Colonial period was exhausting, but Watts and the Assassin's Creed creators believe it was worth the effort to depict the authentic culture of a specific nation.